The gravel voiced James Spencer wrote all four of the sides that he recorded, and both 45s are well worth seeking out. 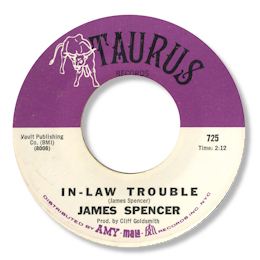 As the title “In-law Trouble” might indicate, his first for Taurus is hard hitting West Coast soul, splendidly organised by the great Cliff Goldsmith, on which Spencer howls out his anger in magnificent fashion. His second single from Tennessee “Take This Woman Off The Corner” is pretty well known to funk fans but the deep flip needs a bit more acknowledgment in my view. 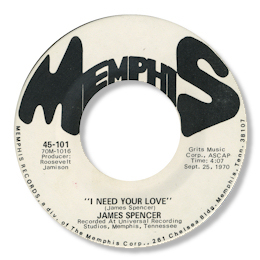 I Need Your Love is a lovely piece of Memphis balladry, just check out the lovely gospel piano/organ interplay for example, and Spencer more than delivers the goods. The producer was long time James Carr writer/friend/confidant Roosevelt Jamison. UPDATE ~ Bob Abrahamian writes to remind me that Gene (Chandler) and Jerry (Butler) had a hit with "Ten And Two (Take This Woman Off The Corner)" their version of Spencer's song. I'm grateful to him of course for this. Also the highly knowledgeable Katsuaki Sano very kindly writes to ask if the guy on Taurus is the same as the singer on Memphis. He says this has long been a subject of debate in Japan. Can anybody shed any light on this? UPDATE ~ Davie Gordon writes to point to Marv Goldberg's excellent site which has a page on The Sevilles who cut for Galaxy, for whom James Spencer was the lead singer. You can find Marv's page here. Davie goes on to say "Marv doesn't mention the Taurus single but given Cliff Goldsmith's involvement they must be the same guy. I'm inclined to agree that the James Spencer on Memphis is another guy with the same name." I'm very grateful to Davie for his good eyes.